Is NYC a bicycle-friendly city? Not according to some cycling advocates, who say that though the city should be commended for putting in more bike lanes, they should do a better job of enforcing traffic laws. The outcry comes on the heels of two recent cycling deaths in Brooklyn, one of an 8 year old boy and one of a 50 year old man. That brings the death toll for cyclists in NYC for the year to 9. As the wife of an avid cyclist and friend of many people who commute on bikes, I’m always concerned for their safety while they bike in the city. Though some cyclists disobey traffic laws themselves, the key thing to remember is that cars are large, made of steel and glass, and weigh thousands of pounds, and bicyclists are small, unprotected, and weigh a couple hundred pounds at most. In a contest of car vs. bicycle, guess which one will win? I think that cyclists should obey traffic laws, and so should drivers. I see plenty of cyclists on the road doing irresponsible things, but that doesn’t mean they deserve to be hurt or killed. They deserve traffic tickets. So do drivers – and during an average cab ride or stroll around town, I see tons more vehicular traffic violations than I do cyclist traffic violations. I know everyone wants to get where they’re going as fast as possible, but at what cost? The cost of someone’s life? I don’t know about you, but I’d rather be late. What do you think the city can do to make NYC more bicycle-friendly? Posted in City Life, Current Events | Comments Off on Is NYC a bicycle-friendly city? 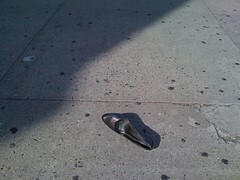 Posted in Uncategorized | Comments Off on Did anyone lose a shoe? Yesterday I was driving in NJ, before I was in Queens in awe of echoes. Well, we were lost as is usually the case when I am in the Garden State. On the street, I was about to make an illegal U-Turn (crossing a double striped line) and from the street to my left a police car was turning in my direction. If I had gone ahead with the full turn, I would have been in trouble. But instead, I used my inched-in positioning on top of the double-do-not-cross line to gain favor of the police officers. Acting gullibly, I asked “Do you know how to get to 9 West?” Well, then he spoke with his passenger-side officer about the dilemma and they discussed while 10 cars waited behind them – holding traffic. Eventually they gave us the directions and made no mention of the illegal turn that could have been. Now I’m not going to ask you to lie, because that is wrong. Lying and deception are two things that I cannot stand. But when you’re lost, you should totally ask the police for directions. That is all I’m going to say. Usually you have to be in the mountains somewhere, way up high or in a cave or maybe some really acoustically enhanced building to experience echoes. What I didn’t realize just until yesterday is that there is an echo underneath the 7 train all throughout Queens Blvd. You might have seen the space under the above ground train tracks being occupied by cars. Well yesterday when I was in dire need of a restroom and crossed my way to the Burger King on 40th street and Queens Blvd. I experienced this echo and was instantly amazed. Well then we just all started hooting and hollering and saying ‘hello’ which seems to be the most common phrase uttered when an echo is recognized. You don’t have to take my word for it, try it out for yourSELF. I was meeting a friend for lunch today and felt like some good comfort food. My coworker suggested Pizzeria Numero 28, describing it as the best pizza in the city. We walked through a drizzly rain in the West Village to get to the restaurant. With the wet weather, we opted for one of their indoor tables (we had our pick). The prices weren’t that great for even their smallest pizza (around $15), so we decided to split a 14 inch Buffalo mozzarrella, tomato, basil pie. The pizza didn’t take long to arrive and it was delicious. Fresh and perfect with awesome crust. We could have easily split a larger pie, since I devoured my half so quickly. I’m not sure that it really was the best pizza in the city (there’s a lot of ridiculously good pizza places), but I would say it’s up there. Definitely a good lunch for a rainy Friday. Police find solace in ice cream! I saw this on my way home from a photo show opening of Minor White (more to come on the show) and just couldn’t resist. Taken with an Epson R-D1 with Leica 35mm lens. Enjoy. 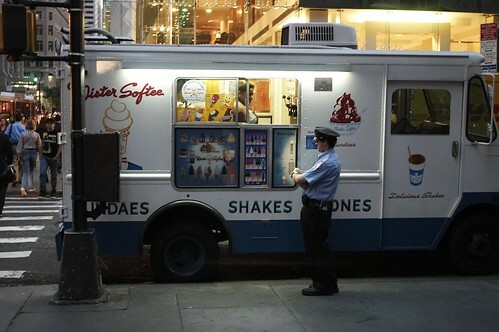 Posted in NYC Pics | Comments Off on Police find solace in ice cream! Seven years ago today, the world stopped for the city. The greatest city in the world was hit the hardest it has been in its 400+ years of existence. The city that never sleeps, was brought to its knees. Only momentarily though. Like only New York can, it rebounded, kicked back and was its alive self in a few hours. The blood in its veins, cut off at the time of the airplane attacks, started flowing…the subways were back on line at 7 pm. A lot of people will say we need to move on, and yes we do. Therefore we are not in perpetual mourning for 364 days. However this one day we need to stop and think of what happened and what has collectively changed for the citizens for this city and as a matter of fact for the whole country post 9/11. Surprisingly, the NYTimes does not have a single mention of today on its front page. Wonder why. I am really disappointed especially as a long time reader and fan of the NYT. I leave you with this image from the NYT, and the knowing that you will be thinking about the same issues that I am in this election year. OK so the pompous title got you to read eh ! Well this post is about one of my favorite lunch options and which I invariably partake one day of the week. These are the halal carts all over the city but especially out in force in my neck of the woods around 6th Avenue and 19th street. If you stand at this location you can see 4-5 carts within a 100m radius. What really surprises me is the price of the food. It has been the same for over two years. Anywhere between 4 and 5 bucks will get you a huge portion of Chicken/Lamb/Falafel over rice with lettuce and tomato. It has not mattered that in the same time frame the price of gas has gone up more than 60% (or more). We went to Governors Island for the first time this weekend. Despite the forecast and the gray clouds, we boarded the free ferry from lower Manhattan and rode out to the historic island. The place is very cool – lots of old, brick buildings, tree-lined paths, an art show, and areas to explore. Due to uncertain weather conditions, we practically had the place all to ourselves (though there was a group of people oddly playing croquet). The island would be a perfect location for a horror movie – old abandoned buildings, former military base. Saturday’s dark weather seemed to fit. We explored an old weapons storage building, which had partially flooded from the rain. The place is complete with mysterious doorways and peeling paint. I kept imagining that the door would close on us and then some sort of mutant recluse would emerge with murderous intentions. But we made it out and were soon hurried onto a ferry by some nervous rangers – they planned to close up the island due to rain (which really wasn’t that bad at the time). I hope to return sometime when the island is free from any tropical storms.